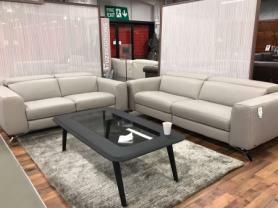 Mizzoni Italia full beautiful full thick ivory leather 3 and 2 seater sofa. Slim and modern design with slick lines which enhance the look of any room. Off the floor model with beautiful wooden feet, spacious seating so you can relax with style. Approximate Measurements: 3 Seater: 190 cm. 2 Seater 150 cm. Depth: 87 cm.